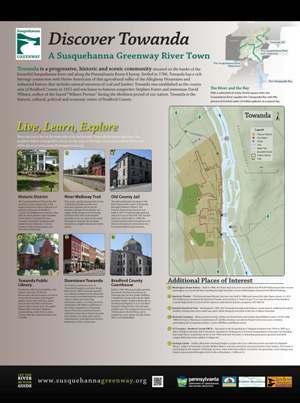 Towanda is a progressive, historic and scenic community situated on the banks of the beautiful Susquehanna River and along the Pennsylvania Route 6 byway. Settled in 1786, Towanda has a rich heritage connection with Native Americans of this agricultural valley of the Allegheny Plateau and industrial history that includes natural resources of coal and lumber. Towanda was established as the county seat of Bradford County in 1812 and was home to famous songwriter Stephen Foster and statesman David Wilmot, author of the famed "Wilmot Proviso" during the Abolition period of our nation. Towanda is the historic, cultural, political and economic center of Bradford County. The Towanda Historic District has 441 structures and contains one of the largest and most varied collections of period architecture in Bradford County. The walking tour features sites with bronze plaques representative of the district's beautiful homes, churches and public buildings with Greek Revival, Italianate, Second Empire, Gothic, Romanesque and Victorian architecture. This scenic, gently sloping trail of over 10,000 feet of paved surface has become a popular attraction for people of all ages from all over our region. Built mostly over the former location of the old canal towpath along the river, it connects the entire Borough to industry, the hospital, downtown, neighborhoods and other points. The old county jail is located at 109 Pine Street in the center of Towanda Borough's Historic District. The massive three-story structure was built in 1871-73 with locally quarried stone at a cost of $67,000. The outside walls are 3 feet thick. In 1998, the county transferred the property to the Historical Society for renovation into its research library and museum. Donated in 1897 by Frank Welles, this historic structure of Flemish Renaissance Revival features red brick, terrecotta decoration, tall stepped gables, steep roofs with lacey spires, faux dormer windows and round towers with canonical roofs. The public library offers excellent children's programming, adult classes, and a strong collection about the American Civil War. The historic downtown area of Towanda Borough is centered along Main Street. With Towanda's growth as a vibrant manufacturing, industrial and research and development center came a robust and charming downtown center. A variety of stores, restaurants and offices contribute to the visitors' experience of Towanda. Some of the most varied and intact collections of period architecture exist here. Visitors can shop, dine and be entertained in the beautiful and historic downtown of the County seat. Built in 1897-98 using locally quarried limestone, the third courthouse in Towanda was the first public building in Bradford County with electric lights and flush toilets. Listed individually on the National Register, it is an excellent example of Beaux Arts Classical style architecture. The octagonal dome rises 70 feet above the first floor and is topped by a rare statue of Lady Liberty that is not blindfolded.